Writing a Letter Of Demand for payment is usually the last step you will take when trying to recover an unpaid debt before taking legal action. 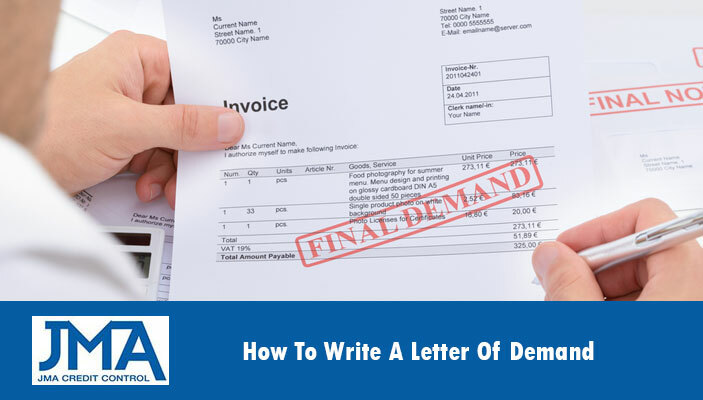 You should only consider writing a letter of demand if all other reminders and friendlier options have been exhausted, and your debt has still not been paid and the debtor is making no effort to arrange payment. If an account is overdue a simple email or phone cal can sometimes be all that is needed to remind the debtor they have missed the invoice payment date and that they must make arrangements to pay the invoice straight away.This is a friendly reminder, which is very casual and keeps the relationship on good terms. Your first reminder letter should be a short, friendly reminder that the account is overdue. At this stage the bill may have slipped the debtors mind again or they may be waiting for some incoming cash flow to pay you account.Simply state at the top of the letter that it is regarding the outstanding amount, when payment was due and include a copy of the account statement.It is best to advise them to pay the account today or contact you to make payment arrangements. At this stage if you still have not received payment or arranged a payment agreement, then an ADR is an option you may want to consider. Depending on the value of this customer to your company this is a solution that may be able to save the relationship as a last resort before sending a letter of demand or taking legal action. Below are the elements you must include in your letter of demand and to ensure you do everything by the book so you are protected and have all necessary documents in case legal action is required. The debt collection process can be slow and time consuming for a business owner. Going through all these steps can take months and drain your businesses cash flow, and often when chasing up debts yourself a debtor will not take you seriously until they receive some type of formal document from a solicitor. To fast track the debt collection process and save you time and money you can use a reputable debt collection company to handle all your outstanding debts. At JMA Credit Control we provide low cost, flexible one-off debt collection services, or for a small annual fee we can become your outsourced collection agency. Often the introduction of JMA Credit Control’s name at the start of the collection process is enough to get most debtors to pay immediately or arrange payment. Our commissions are as low as just 3.5% and we have a No Refund = No Fee policy. Our in-house solicitors can even draft a Letter Of demand on your behalf and list defaults against the credit ratings of company that do not pay your invoices on time. If you would like to learn more about our low cost, flexible debt collection services Contact Us.